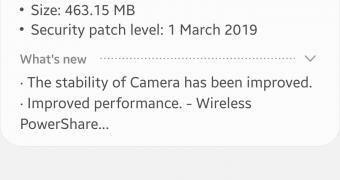 Samsung has just released the Galaxy S10 March 2019 software update that brings both security and non-security improvements. The update is rolling out in stages to all three models in the Galaxy S10 lineup, namely the Galaxy S10e, the Galaxy S10, and the Galaxy S10+. However, keep in mind that availability depends on a series of factors, and the release takes place in waves, so some devices will get it sooner than later. For now, the United Kingdom seems to be among the first markets getting the update, with other European countries likely to follow soon. Germany has also received the update, as per this reddit thread.